As May 4, 1945 dawns, the end of the war in Europe is near. Munich has fallen to the U.S. 7th Army. Nearly a million German troops in Italy have laid down their arms. P-51s from the 354th FG now complete a recon sweep and the skies are clear. On the autobahn below, paratroopers of the 101st Airborne and allied units advance past German P.O.W.s who march toward internment in Munich. 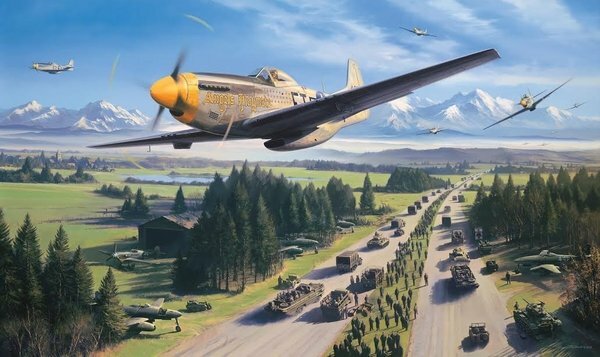 For the 101st Screaming Eagles, Hitler’s “Alpine Fortress” lays ahead but a hard-earned victory is now in sight.